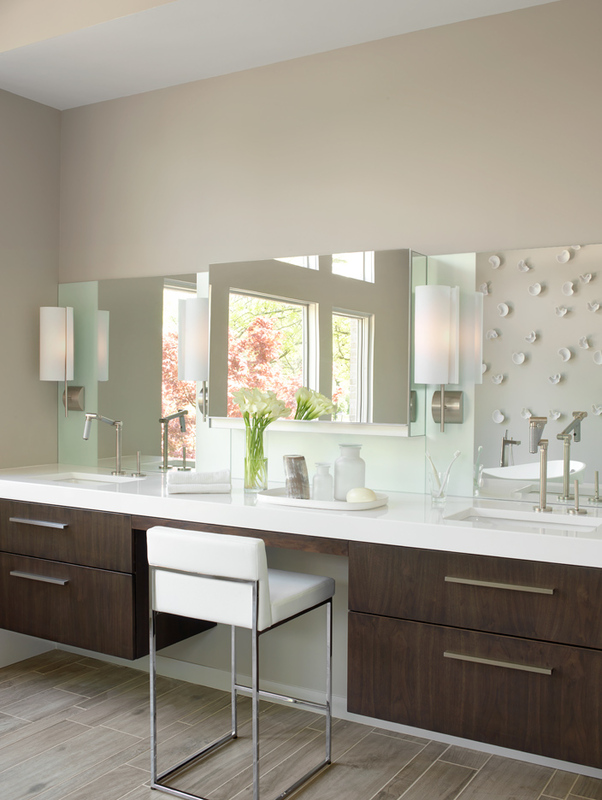 When the homeowners had utilized their master bath beyond capacity, brooksBerry Kitchens & Baths was called in to open up their space and provide more storage. Eliminating cabinets and replacing them with more efficient closets, the homeowners gained more storage and a sleek, minimalist master bath. The modern, peaceful aesthetic is highlighted by the organically shaped aromatherapy soaking tub, which floats between the wall of windows and a linear wet/dry bench seat. 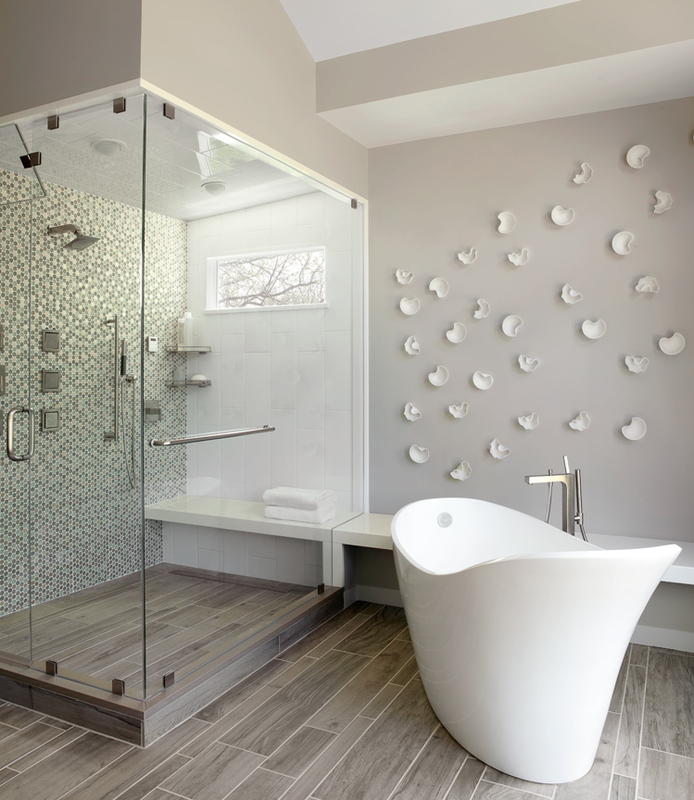 Behind the tub, a beautiful wall of undulating lozenge-like, penny-round metal and glass mosaic tiles provides an artistic element. A glass cube steam shower is equipped with hand and body sprays. The wood-look tiled floor seamlessly continues into the shower. brooksBerry created a sense of lightness in the space with multiple layers of controllable illumination, indirect under-cabinet/under-bench lighting, makeup/shaving lights and recessed general lighting with an emphasis on natural light from the windows. 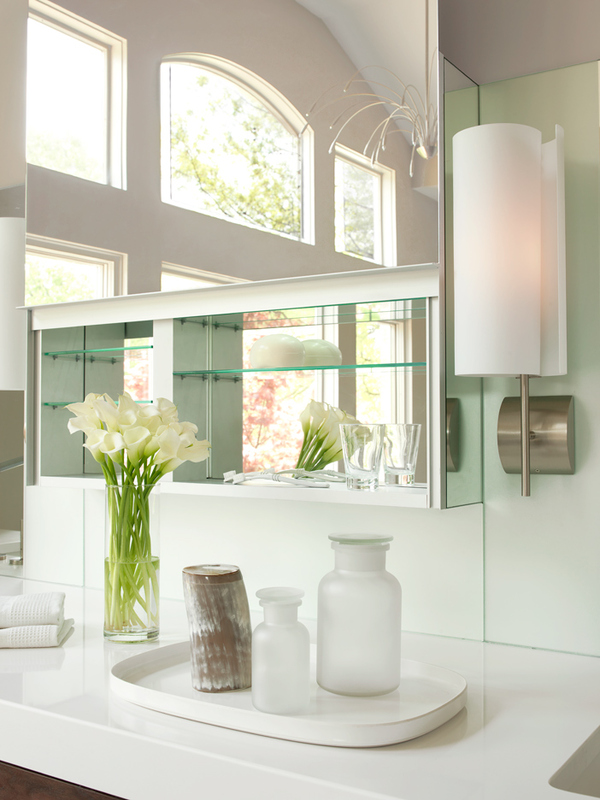 The Parsons table-inspired vanities feature an uplift door medicine cabinet, and an alternating sandblasted/clear glass mirrored wall diffuses sconce light. This master bath is the ultimate in relaxation. The space in this bathroom was used wisely. The tub and toilet selections are excellent. Hung independently, the decorative wall pieces are like mini sculptures, not just one piece of art. The high window in the shower lets in great natural light.